You invest money to secure your financial future, but do you think before investing money? Investing money in right asset class at right time is very important for achievement of you goal. Your ability to invest money in right asset class depends upon your financial knowledge, analysis, your time, motivation and what type of advice you receive. Today I will share with you 7 ways people use to invest their money. Let’s checkout which way do you use and why? First way is to invest money on your own. You carry out study, analysis and take decision to invest in right asset class. Here you are acting as independent entity and taking decision on your own based on your wisdom. This is best way to invest money. As you are taking decision on your own and it is informed decision in your favour. Second way to invest money is based on advice of friends and relatives. Today almost 60% investors fall under this category. They invest their money just by listening to advice. They don’t bother to carry out due diligence exercise before doing investment. This is most risky way to do investment. These types of investors are usually found in share market. They invest their money based on so-called share market Tips. Sometimes this tips works but it is all depends on reliability of source from where you are getting this tips. It is not advisable to invest money on these tips. Another most common way people invest their money is based on advice of broker. This is most risky way of making investment because majority of time it is seen that broker is either inexperience or giving biased advice for his own interest. One should not make any investment based on broker’s advice. Certain people invest money on advice of commission agent or insurance agent. They probably don’t know that commission agent or Insurance agent gets big commission for selling these products. This is another ineffective and risky way for making investment. 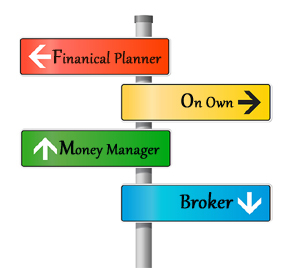 You can appoint money manager to invest money on their behalf. Manager invests money according to specific plan, monitor portfolio on regular basis and make changes as per requirement. You will be observer to entire process and result. Another way people invest money is by taking help from financial expert or financial planner. These types of investors make proper financial plan and invest money as per financial goals. This is most suitable and advisable way for making investment. So which way you should take for making investment. Take following quiz to get answer. If your answer is – Yes for all five questions, Bingo you are self sufficient & you can invest your money on your own. If your answer is – No for question 1 and 2 than you need advice from financial expert or planner for investment. If your answer is – No for all questions than you need money manager or financial planner for making investment. Way 3 and 4, Investment based on broker advice and on tips is debatable as it is not ideal choice. If you have ample amount of money and you are ready for loss you can select those options. Way 5, investing based on advice of insurance agent or commission agent is not advisable as commission is involved, agent will advice investment option based on his interest. Way 2, investing based on advice of relatives and friends is risky and not advisable. So, which way you prefer and why? Do share with us. You can follow us on Facbook.